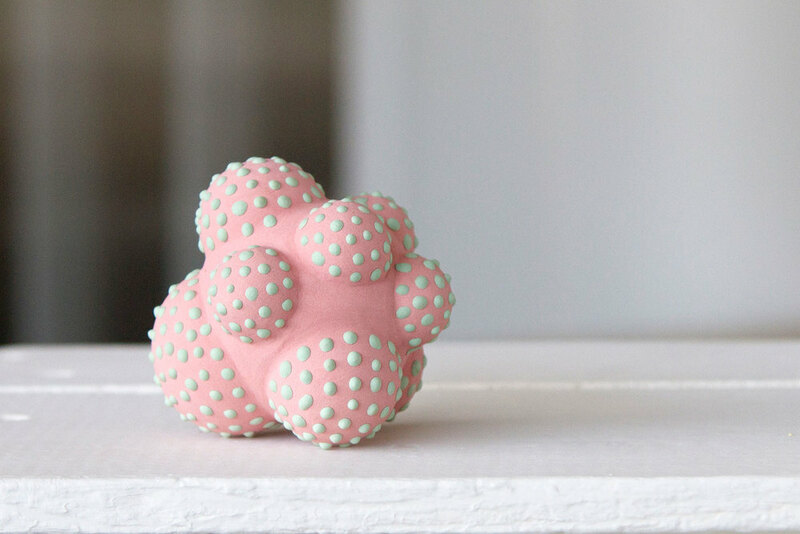 Sarah Hicks & Anthology Objects creates sculptural and functional objects of art and design. I bring you whimsically elegant hand crafted ceramic pieces that celebrate my artisan sentiments and the joy of making. Simple yet refined, playful and imaginative, my objects aim to enhance your lifestyle with an aesthetic experience of joy and delight. My work is inspired by collections of forms, shapes and patterns occurring in natural world. Growing up I had the freedom and space to investigate and explore the phenomena of the physical world. From slimy green algae growing on my uncle’s pond to gelatinous sacs of tadpole eggs in Labadie Creek to hunting for Morel mushrooms on “the Land”, the memory of these images and experiences continue to inform my work today. Replete with drippy clouds, juicy stalactites, delicate membranes, splats, blobs, drips, prickly amoebas and Spartan flowers my work utilizes these archetypal shapes and imbues on them a graphic quality that is decorative and highly stylized. The systematic and rhythmic surfaces of my work are treated with an intensity of color, stripe, dot, pattern and texture. Dizzying, succulent and calming, my work strives to creates a tactile, visual and fantastical experience, one that is meant to impart you with a healthy sense of zip and whimsy. Born and raised in Labadie, Missouri a small town west of St. Louis, I had the good fortune of growing up with a family of talented artisans and makers. Through them I collected a range of skills that contribute to the work I make today. I learned textile arts such as sewing, spinning, quilting and weaving through my mother and was influenced by father’s talents as a builder, woodworker, traditional cabinetmaker and armchair horticulturalist. These experiences imparted in me an appreciation for fine craft and the handmade. Those experiences frequently influence my choice of patterns, color and texture in the surfacing of my pieces. I currently live and work in Chicago, IL where I received a Bachelor of Fine Arts from the School of the Art Institute of Chicago in 1999. I have exhibited work in many venues both locally and nationally.